Battery Test System for Automated Characterization Testing, Power Cycling Testing, Life-Cycle Testing & More! The Battery Module/Pack Test System (9200 Series) is designed for all battery chemistries including lead-acid, nickel-cadmium and lithium-ion. This battery test system is ideally suited for applications where maximum tester configuration flexibility is needed to adapt to a broad range of battery voltage, current and power requirements now and in the future (see diagram). Another good fit is where high-speed set & measurement are necessary to better characterize battery transient performance. A third application is where easier and faster test program creation is desired. All applications benefit from the battery test systems discharge power recycling capability, which results in both a cooler test environment and system cost recovery in a few years. Other battery pack test system applications such as battery emulation, battery charger test and power supply burn-in are covered in supplemental product bulletins. 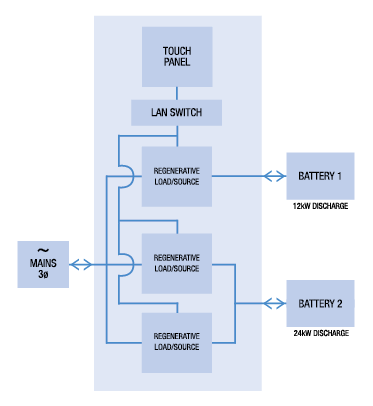 A Battery Emulation Mode is provided within Enerchron for testing certain power electronic systems that now utilize a real battery to source and load the product-under-test. In this Emulation Mode, the test channel will source and sink current as needed to maintain voltage regulation. Having a programmable battery emulator provides a more consistent testing capability for products such as chargers, regenerative braking systems, and on board DC/DC converters. Regenerative, returns greater than 87% of power to the facility, which provides significant electrical savings.